Competitive ice speed skating is not a sport many people actually know about or participate in. While it is true that the world of sports is being dominated by male athletes, it is worthy to note that their female counterparts are beginning to take their place in sports. From football to handball, to basketball and whatnots, we’ve seen a lot of women excelling in sports of their choice. 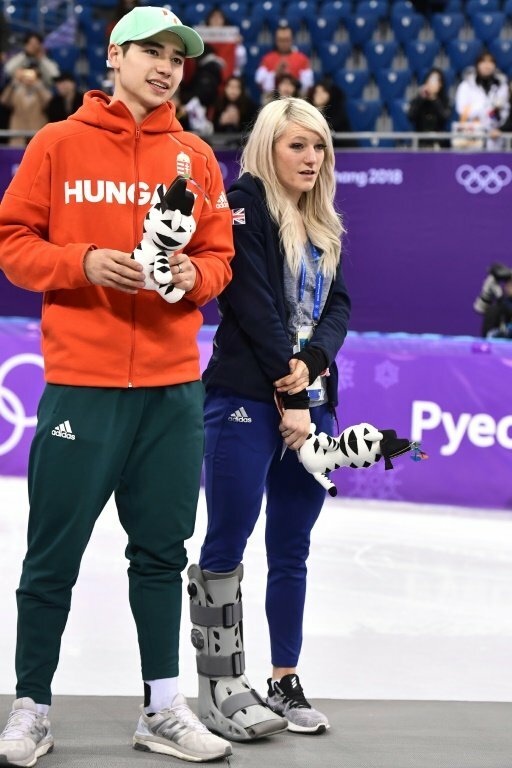 In the United Kingdom and beyond, a conversation about short track speed skating wouldn’t end without mentioning Elise Christie, a beautiful athlete who has forged a path for herself in the game, having won several gold medals as well as fame and fortune. Elise Christie is the daughter of nurse Angela Wright. She was born on the 13th day of August 1990, in Livingstone, near Edinburgh, Scotland. There’s little information about her background but we learned that her parents divorced in the year 2004 and it is not known if the athlete has siblings or not. Christie is a graduate of St Margarets Academy, Livingston and she is currently studying sports science at Loughborough College, in Leicestershire England. She began skating at the age of seven, discovered the thrill of raw at the age of twelve and at fifteen, she got an invitation to commence a full-time training at the National Performance Center in Nottingham. Elise apparently inherited her athletic skills from her mother whose career in the long jump was cut short by a knee injury. The British short track speed skater, who specializes in 1000 meters, holds two European titles (won in 2015 and 2016). She stands as a ten-time European gold medalist as well as the winner of the world titles in the 1500 meters and 1000 meters events at the 2017 World Championships which took place in Rotterdam. Christie also went home with the overall gold at the same competition, making her the first European woman and the first British woman to achieve such a feat. It was at the 2015 European Championship that Elise Christie earned her first overall European title. She finished second in the 3000m super final and won gold in the 500m and 1500m at the event that took place in Dordrecht, Netherlands. The following year, she went ahead to retain her overall European title at the European Championships in Sochi, Russia, by clinching gold in the 1500m, 1000m, and 500m events. The athlete was supposed to bag more gold medals at the 2017 European Championships but she declined to take part in the event because she wanted to train herself for the 2017 World Championships. Elise Christie has also set a mark for herself at world championships. The athlete won a bronze medal in 1000m at the 2013 World Short Track Speed Skating Championships in Debrecen, Hungary, and also emerged the champion at the 1000 meters event for the 2012–2013 World Cup season. The following year, she emerged the 4th overall and also won a silver medal (500 meters) at the 2014 World Short Track Speed Skating Championships, which held in Montreal, Quebec, Canada. Elise would win two silvers (1000m and 500m) at the 2015 World Short Track Speed Skating Championships that took place in Moscow, Russia, becoming the first British skater to earn two medals at the competition. 2016 was a bigger year for Elise Christie as she won four medals at the 2016 World Short Track Speed Skating Championships. The event, which took place in Seoul, South Korea, saw Christie win silver in 1000 meters, a bronze in 1500 meters, as well as another bronze in the 3000 meters. Elise Christie could possibly be single right now. Her last known relationship with her boyfriend crashed after the 2018 Olympics. She was previously in a relationship with a Hungarian short track speed skater called Shaolin Sándor Liu. The pair started dating in October 2015 and broke up in 2018. Liu is the son of a Chinese man and his Hungarian wife, who gave birth to him on November 20, 1995, in Budapest, Hungary. 1. The name of her coach is Nicky Gooch. 2. In 2013 and 2015, the British short track speed skater was named Nottingham Sportswoman of the Year (she was the runner-up in 2014). 3. In 2017, Christie was unveiled as Sunday Times Sportswoman of the Year, in recognition of her superlative performance and victory at the 2017 World Championships. 4. Elise Christie was once shortlisted as BBC Sports Personality of the Year. 5. In her younger age, she was bullied at school. 6. She is 5 feet 3 inches (1.60 meters) tall and weighs 54 kilograms. 7. Elise Christie has been disqualified severally at competitions. In 2014, she was disqualified at the Winter Olympics in Sochi, Russia for colliding with an Italian skater called Arianna Fontana. This led to her shutting down her Twitter account after she was threatened online. Elise Christie was also disqualified twice at the 2018 Winter Olympics. 8. In the year 2016, she was hailed as the “fastest woman on ice” after setting a new world record in the quarter-finals at the second World Cup meeting of the season in the 500m short track speed skating event which took place in Salt Lake City. A special banner commemorating her success was also unveiled at the National Ice Centre. 9. Elise Christie went home with the overall bronze medal after winning a silver medal in the 3000 meters and 1500 meters at the 2010 European Short Track Speed Skating Championships that took place in Dresden, Germany.